Our family just got our first cell phone (we’re late adopters of most technology, though we were early adopters of Macintoshes—I had one of the first model with 128k RAM). The cell phone is not for my wife or me (neither of us likes talking on the phone), but for our son, who needs it to be a “prefect” on the school trip to the Oregon Shakespeare Festival. The prefects have to keep tabs on a group of about 4 other kids who share the same hotel room and serve as a node in a phone tree if plans change. Last year there was a last-minute change of schedule moving one workshop 2 hours earlier, and the phone tree worked well for alerting all the students. Because this is our first cell phone, we wanted one with low initial cost and no long-term contracts. What we ended up with was a $30 phone and an AT&T $2/day plan, that offers unlimited minutes and texts and no monthly charges, but charges $2 for each day that the phone is actually used. Since he does not expect to use the phone much, we’re more worried about time we’ve paid for expiring (the $25 we prepaid will expire in 3 months, unless we remember to add more money before then). One nice feature of the AT&T plan is the lack of roaming charges in the US, especially as he will be using the phone mainly while traveling. Since he is planning to use the phone only for the school trip and for emergency calls (like letting us know that he’ll be late because of a flat tire on his bike), we are paying for the plan. If his use changes and he starts using the phone recreationally, he’ll be responsible for paying for the plan (and he’d likely change to a different plan, since $2/day is expensive if you use the phone every day, though cheap if you use it rarely). Data transfer is very expensive at 1¢/5KB ($2/MB, $2000/GB), but we got a cheap phone (with a keyboard) which will not tempt him into much downloading (we hope). This plan cannot have a data plan added to it—we’d have to switch to a $25/month with an extra $15/200MB or $25/GB. At those prices it might be worth looking for a cheaper phone company. If he goes to college with this phone (possible, but not very likely), he’ll probably take an iPod Touch with WiFi as well, so that he can do web browsing—most college campuses have pretty good WiFi coverage for students, though the coverage off campus would be poor to non-existent. It’s possible that by then he’d want a smartphone, even if the contracts cost $70/month ($30 for 3GB, $40 for voice). At lot of parents of college students on the homeschool-to-college email list have been recommending that college students take a phone with texting capability to college with them, even if they haven’t been using one in high school. Not only are emergency alerts used on many campuses sent more quickly with text messages, but a lot of social organization seems to happen by text messages, as students don’t seem to rely on face-to-face meeting to arrange their lives any more. Now that my son has a texting phone, we’ll see if it makes any difference in how he does things. My son and I went on a prospective-students’ tour of UC Berkeley today. Because the information session and tour was scheduled very early in the day (starting at 9 a.m.), and public transit from Santa Cruz to Berkeley is slow (about 3–3.5 hours, using 3 different transit systems), we actually left last night, shortly after my early evening class ended. We started with the 8:15 p.m. SCMTD Highway 17 Express bus over the hill for $5. It’s a fairly comfortable bus, being a relatively new natural-gas powered bus with soft slightly reclining seats, air-conditioning on hot days, and free WiFi. We took advantage of the soft seats to nap a bit, but did not try the WiFi, having no WiFi devices with us. Then we took the VTA 181 Express from the Diridon train station to the Fremont BART station. This bus costs $4 for adults, $1.75 for children under 18, and spends a big chunk of the trip on the freeway after a couple stops in downtown San Jose. The bus was packed, apparently with San Jose State students going home from evening classes. Unfortunately, the ride was on a poorly maintained rattletrap bus with shocks that should have been replaced about 100,000 miles ago. The seats were hard, the floors dirty, and knee room close to non-existent. I’m guessing that either there is no money in Silicon Valley any more to maintain their bus fleet (or their roads) or that the money is concentrated in the hands of a few people who think that bus riders are so low-class that third-world quality is all that is needed. Perhaps VTA has been sinking all its money into expanding the light rail service and neglecting maintenance and replacement of its bus fleet. The BART train ride from Fremont to Berkeley ($4.35) was fine—the ride was fairly smooth and the cars clean, though it was clear that they were far from new. It was a step up from the decrepit VTA bus, but not as comfortable as Caltrain or even the Highway 17 Express bus—and I usually find trains and light rail much more comfortable than buses. Our connections were all excellent, and we got to Berkeley an hour earlier than Google Maps had suggested—the Highway 17 Express had made good time and we caught an hour earlier 181 than Google thought was possible. (The usual schedule calls for the 181 to leave just before the Highway 17 Express arrives, since the transit agencies don’t think much about synchronizing between systems.) We made it to our motel (Berkeley Travelodge) just over 3 hours after leaving our house, getting in before 11pm. Since the distance is 76 miles by car, we averaged about 23 mph, which is twice the speed of the public transit we took in LA. The Travelodge had one of the smallest motel rooms we’ve stayed in (barely room for the 2 beds), and it smelled a little musty, but we slept well enough despite that. The “continental breakfast” was also about the feeblest attempt at that we’ve seen—I had a cup of tea providing my own tea bag and a tiny sweet roll in a plastic package. Our poor breakfast may have contributed to low blood sugar and less enthusiasm than we might have had with a decent breakfast. In the morning we walked to Sproul Hall, the administrative building on Sproul Plaza where the information session was scheduled. The info session was so early in the day (9 a.m.) that the campus was nearly deserted as we walked across it to Sproul. Even Sproul Plaza was nearly empty. Because we are doing our college visits off-season, there were only 2 families at the information session: a father and son from New Jersey and us. The admissions officer gave us his standard monologue, which was perhaps the least informative of the information sessions we’ve been to so far. The video they showed us seemed more intended to recruit parents to donate to the college than to be helpful in deciding whether UCB was a good fit. It was difficult to ask questions, because the admissions officer giving the session maintained a continuous monolog (often about his family and career, rather than about UCB) that did not pause long enough for us to insert a question. I did manage to ask one question about how home-schooling students were handled, but was told very little in response: there is no home-school supplementary form and that UCB does admit a lot of home schoolers. My son did ask a question about the difference between the engineering CS program and the letters and sciences CS program, which the admissions officer should have admitted he didn’t know, as the answer he gave was clearly incorrect, based on what we had read about the programs on the web. The only substantive advice in the whole presentation was that the student essays should focus on achievements, not just activities, and that depth and duration of an activity are more important than breadth of different activities. This was not news to us, but it was more clearly presented than at other colleges. The depth-rather-than-breadth focus is good for his admissions chances, as my son has two activities that he has been engaged in for a long time: theater for the past 12 years, science fair for the past 8, for both of which he has positive outcomes to talk about, though no obvious super-star status. For example, he’s never won his category at state science fair, but he has gone to state 6 years running (a distinction shared by only about a dozen students), and he did make 3rd in his category one year. Since all his science fair projects have been in the field he plans to major in, tying them into his application should not be too difficult for him. The tour itself had more people on it than the information session, and was fairly ably presented by the student guide. It was not as sports-focused as the University of Colorado Boulder tour—perhaps not even as much as the UCLA one, though there was more mention of traditions surrounding football games than we were really comfortable with, and the tour guide referred to the sports terms in the first person (“we won …”), even though she was not on the team herself (she did play in the band that accompanies one of the teams). As with the UCLA tour, we did get to see the interiors of a couple of buildings (the huge Valley Life Sciences Building and the Doe Memorial Library), but no classrooms. The interiors we were shown looked more like museum entrances or film sets than like working parts of the university. Because the dorms are at the uphill edge of campus, they were only pointed out to use from a distance. By the end of the tour (around 11:30 a.m.), Sproul Plaza was bustling, though the tour guide had felt obliged to apologize for how dead it was at 10 a.m. Overall the Berkeley tour was perhaps the blandest and least distinctive of the tours we’ve had—it told us almost nothing about how well the school would fit my son’s needs. My son had tried to set up an appointment with a CS faculty member at Berkeley, but he’d left it rather late, and the faculty member had said just to stop in during his open office hours (11–12) as he had no other time today. The trek from Sproul Hall to Soda Hall is a fairly long one (½ mile) for such a compact campus, and when we got there the professor was in a meeting (apparently with grad students). We waited around for about 5–10 minutes, but it didn’t look like he was going to be free, so we left without meeting him. We looked over Soda Hall, which is a nice new building. We noted that it seemed awfully sterile: there were no conference posters, no announcements, nothing to break up the stretches of blank wall. The faculty offices all seemed to be tucked away in lab pods behind closed doors—we saw no welcoming open doors as at Harvey Mudd. They had a big TV screen in the main lobby flashing up research posters and unidentified pictures, but none of the posters stayed on the screen long enough to read more than the title, and the resolution was too poor to read the poster even if it had been up long enough. It looked like a movie set of a “futuristic” computer science department, rather than a real one. The only lab we saw was the one where we waited for the faculty member—it had a huge bullpen of cubicles for grad students, a few conference rooms and offices, and a kitchen. It looked like a department unto itself, and I wonder whether UCB is organized into independent fiefdoms that don’t talk to each other, the way so many large departments are. We had lunch in a courtyard just down the hill from Soda Hall, that Google Maps currently identifies as “Northside Asian Ghetto”, which I doubt is any sort of official name. There were several Asian restaurants (Korean, Chinese, Himalayan, Japanese (udon), Japanese (donburi), Vietnamese), and lots of students and faculty eating lunch. I suspect that it is a favored hangout for CS students, though the few textbooks I saw were not likely texts for CS students. We saw a lot of students eating in groups, but we also saw a lot sitting by themselves. Although we did not get a chance to talk with any faculty, we did get a chance to ask some CS undergrads about the program. It seems that the classes are even bigger than at UCLA, with 400 or more in the lower division and 100–200 in the upper division. There is more opportunity to do research, but students have to hustle a bit to find it—some of the students admitted that they didn’t know anything about research opportunities, as they had never tried to get involved, while one had done research his freshman year but had since dropped it. I worked in one more visit, to the theater department to find out whether non-theater-majors had any hope of getting parts in productions. The answer was a definite “yes”—they do open casting for all productions with no slots reserved for theater majors or minors. The acting classes are the same way, though I note that Theater 10, 11, 110A, 110B, 111 all require an audition (a 1-minute monologue) to get into, and Theater 12, 162, 163 require an interview [ http://tdps.berkeley.edu/programs-courses/courses/class-auditions/ ]. The Acting Focus minor, which consists primarily of audition entry acting classes, looks like a pretty good fit for what he wants to do with theater in college, so that part of his education could be easily met at UCB. Overall, UCB looked like a better fit than UCLA, but not really thrilling. Even though UCB has only about 25,000 undergrads (smaller than the undergrad university I went to), it is big enough and the faculty distracted enough by grad students and research, that it would be easy for undergrads to get lost in the shuffle if they didn’t push themselves forward. We took the BART, VTA 181, and Highway 17 Express back home, again getting excellent connections. The VTA 181 bus this time didn’t rattle quite as much (the shocks were not completely gone), but it stank of stale urine. VTA really needs to work on their cleaning and maintenance problems! We’ve got one more visit to do this Spring (Stanford), then a few more to do in September (MIT, Olin College of Engineering, maybe CMU and U Washington). He may apply to a few others without visiting them, visiting only if admitted. Wilson’s Principle No. 1: It is far easier for scientists to acquire needed collaboration from mathematicians and statisticians than it is for mathematicians and statisticians to find scientists able to make use of their equations. Wilson’s Principle No. 2: For every scientist, there exists a discipline for which his or her level of mathematical competence is enough to achieve excellence. The first principle is probably true, but is more a sociological statement than one inherent to the disciplines: applied mathematicians and statisticians welcome collaborations with all sorts of scientists and are happy to learn about and work on real problems that come up elsewhere, while biologists (particularly old-school ones like Dr. Wilson) tend not to be interested in anything outside their own labs and those of their close collaborators and competitors. During my decades of teaching biology at Harvard, I watched sadly as bright undergraduates turned away from the possibility of a scientific career, fearing that, without strong math skills, they would fail. This mistaken assumption has deprived science of an immeasurable amount of sorely needed talent. It has created a hemorrhage of brain power we need to stanch. An undergrad degree in biology (even from Harvard) has not gotten many students much more than low-level technician jobs for most of that time (admission to grad school is the better option, as biology PhDs have been able to get temporary postdoc positions at least). Perhaps Dr. Wilson considers a dead-end job at little more than minimum wage a suitable scientific career—many others do not. The annals of theoretical biology are clogged with mathematical models that either can be safely ignored or, when tested, fail. Possibly no more than 10% have any lasting value. Only those linked solidly to knowledge of real living systems have much chance of being used. Biology is a data-driven science, not a model-driven science (a distinction that physicists trying to jump into the field often miss). Most of “mathematical biology” has been an attempt to apply physics-like models in places where they don’t really fit. But there has been a big change in the past 10–15 years, as high-throughput experiments have become common in biology. Now mathematics (mainly statistics) is needed to make any sense out of the experimental results, and biologists with inadequate training in statistics end up making ludicrously wrong conclusions from their experiments, often claiming high significance for random noise. To understand the data requires more than Wilson’s “intuition”—it requires a solid understanding of the statistics of big data and multiple hypotheses, as humans are very good at perceiving patterns in random noise. I was pointed to Dr. Wilson’s WSJ essay by Iddo Friedberg’s post Terrible advice from a great scientist, which has a somewhat different critique of the essay. He accuses Wilson of “not recognizing the generalization from an outlier cannot serve as a viable model, or even an argument to support his position.” Iddo makes several other points, some of them the same as mine—go read his post! Of course, like me, Dr. Friedberg is a bioinformatician and so sees the central role of statistics in 21st century biology. Perhaps the two of us are wrong, and innumerate biologists will again have glorious scientific careers, but I think the odds are against it. I’m on a couple of the Advanced Placement teacher mailing lists (Physics because I’ve been home-schooling my son in calculus-based physics, biology because I’ve been attempting to get bioinformatics into AP bio courses as a teaching tool). On one of the lists, a fairly new teacher brought up a concern about grading—last year many of his or her top students got 1s on the corresponding AP exam. This triggered an excellent discussion about the meaning of grades and the value of the AP test. In this blog post I’m going to repeat my contributions to the discussion, lightly edited to remove any identifying info, with brief summaries of other views to show what I was responding to (often lumping several people’s ideas together). Having an external calibration (an A in this course is roughly the same as a 5 on the AP exam) is very useful for gauging the level of the course, for the teacher, for the students, for parents of the students, and for the colleges that might admit the student. The AP exam scores, after all, are supposedly set to correlate with the grades the students would have gotten in a first-year course in college. It used to be that 5, 4, and 3 correlated well with grades of A, B, and C, but grade inflation in the colleges appears to have advanced faster than on the APs, so perhaps 5 and high 4s correspond to an A, and low 4s and 3s to a B (depending on the college, of course, as grade inflation is far from uniform). Of course, the AP test does not measure all the things that go on in an AP course, and a student can do well in the course and poorly on the exam or vice versa, but if A students in a course are consistently getting 1s on the test, it leads one to suspect that grade inflation has happened. Similarly if C students are routinely getting 5s, one suspects that the course grading is ridiculously harsh. I am curious to know what portion of the grades in the courses you teach are determined by one, largely multiple choice exam? I’ve never taken a worthwhile course where “passing” was ever determined in such a way. He called it right on that one. I’ve never given a multiple-choice exam in 31 years of being a professor—multiple-choice exams are very difficult to write well, and really only appropriate when there are enormous numbers of test takers to reduce the cost and variance of grading and amortize the large cost of making the exam. For that matter, I give very few exams—most of my courses are graded on the basis of week-long or quarter-long projects, papers, and programs. I’m not particularly interested in the things testable by multiple-choice tests (mainly memory and simple reasoning tasks), but in what students can do with a sustained effort. My most recent course (Applied Circuits for Bioengineers) was graded mainly on the basis of their weekly design reports based on their lab work (about 5 pages of writing a week, and any mistakes in the schematics or explanations meant that they had to redo the writing). I’m not going to defend the AP exams as great ways to evaluate learning, but they are better than the exams that most teachers write and rely on for grading, and they do have the advantage of uniformity across a large number of classrooms. A 5 on an AP exam may not tell me a lot about a student’s capabilities, but I believe it tells me more than an A from teacher I’ve never met and who may have only taught a handful of AP students. I agree that the goal of an AP course is not “college credit” or even “preparation for the AP exam,” but the learning that takes place. But grades and exams scores are used for selecting kids for college admission (as being better than a simple lottery or selection based solely on money or race), so it is better if the exams and grades are as meaningful as they can be made (at reasonable cost—a lot of state testing is providing very little useful data at enormously high cost in both money and lost time). Because teachers have so little opportunity to calibrate their own grading, an external test at the right level provides very useful information. I agree that a single sample of small number of students may not tell you much about the level of instruction in a class, but may be a warning that recalibration is needed. There are many possible reasons for the discrepancy (difference in content between course and exam, difference in level of expectations, student test-taking ability or attitude, random noise, …). For a course labeled “AP”, the teacher has a responsibility to make sure that the content of the exam is covered in the course. As a parent, I would also want the level of expectations in the course to be as high as in a first-year college course. If the students are uniformly doing worse on the test than what the teacher expects, then some reflection on why the expectations are wrong is needed. What if, instead of grades, we could present colleges with better data about what we actually care about: skills that aren’t reportable by traditional methods. When admissions officers are trying to select <6% of the students from 38,828 applicants (as Stanford did this year), it is difficult to process voluminous communications from individual teachers. They rely on summary statistics (GPA and SAT scores, for example) to do crude filtering, then concentrate on student essays and letters of recommendation. The very selective schools sometimes try to correct the GPAs based on grade inflation at the high school (there are databases of information about each high school being sold—I’ve no idea how accurate the information in the databases is, but some admissions offices use them). The college faculty, who might care about the “skills that aren’t reportable by traditional methods”, are rarely part of the admissions decisions. Later in the discussion, after more narrative transcripts were proposed and the value college admissions officers put on letters of recommendation had been introduced, I wrote about my experience with narrative evaluations. I’ve been engaged in this debate for decades. When I started teaching at UCSC, we had almost exclusively narrative evaluations,with optional grades in some classes. We moved to optional grades in all classes, then grades plus narratives, and now to grades with optional narratives. (Incidentally, in each vote I voted in favor of narratives with optional grades.) I have not noticed a difference in how easily students get into grad school, though one of the main arguments used against the narrative-only system was that it was hurting the chances for students getting into med schools, as their “pass” grades were getting converted to Cs by the big med schools, no matter what the narrative said. I think that the real driver behind the switch from narratives to grades was the incredible workload of preparing narrative evaluations for large courses. In many classes, the “narrative” was computer-generated from a list of grades, and not very informative. I had to review narrative transcripts for honors review of graduating seniors, and I often found it very difficult to interpret the narratives. It took a long time to read a narrative transcript, and often told me very little about the student. There was no controlled vocabulary, and the same word might be used by one instructor for a barely passing performance and by another for a truly excellent performance. I could see why med schools could be frustrated by the difficulty of dealing with this format. Nowadays the honors review in the school of engineering is based on GPA, with a well-defined grey region where student research projects can make a difference in the honors rating. I understand that the honors review now takes only a fraction of the time it used to, despite large increases in the number of students reviewed, and the time is spent only on the cases where some thought is needed. As a grad director, I read a lot of applicant files for admission to our program. GRE scores and GPA do matter, but not very much, as the GRE tests essentially the same stuff as the SAT (nothing college level on the general GRE and there isn’t a subject GRE in our field) and college GPAs are often highly inflated, depending on the college. We also get a lot of foreign applicants, whose grades come on a bewildering variety of different scales that are essentially uninterpretable. We expect high GRE scores of all applicants, but decide between them based mainly on their personal statements and letters of recommendation. What we are looking for is strong evidence that the students can do research (not just coursework), and the best evidence is that the student has already done substantial research. Many of our grad students come to us with multiple publications already—more than I had when I got my first faculty position. Narrative transcripts would not be a good substitute for letters of recommendation from faculty that had supervised research—the signal we’re looking for would be buried in the noise of irrelevant comments for coursework that is not that important to us. As a homeschooling parent of a high school junior who is likely to fit in best at a super-selective college like Harvey Mudd, MIT, or Stanford, I worry a lot about how to put together his transcript, school profile, and counselor letter to show that he really would fit in. There are mailing lists with 1000s of readers dedicated to parents worrying about how to get their home-schooled children into appropriate colleges (hs2coll@yahoogroups.com, for example). I’m having to rely heavily on external validation of his coursework, much of which is not even accredited. SAT 2 and AP exams form part of that validation, while college and university courses form another part. Science fairs and contest exams (AMC12 and AIME in math, F=mA in physics) form yet another part, though his contest scores are not stellar enough to make him a shoo-in at the colleges where he would fit, since he does all his exams without prep. We are trying to get letters of recommendation from the university faculty (he’s been at the top of the classes), since those will be particularly informative for admissions officers. In short, I like narrative feedback to students and their parents, but do not find narrative transcripts to be a particularly useful way to select students from a large pool (whether for honors or for admissions to the next level of education). Small numbers of well-selected letters of recommendation are much more helpful. I didn’t say this on the AP forum, but I will have to provide a narrative transcript of my son’s high-school curriculum, as it is pieced together from a variety of different sources. We’ll probably provide 2 formats for the transcript: a one-page one that lists courses and grades (for those courses that have grades) and a multi-page transcript that describes the content and level of each course in more detail. Admissions officers in a hurry can glance at the one-page summary to see that he has taken all the expected courses, and those with more time or more interest can read the detailed descriptions to see that the courses were solid, even if not officially accredited. Teachers participating in this discussion seemed to be in agreement that an AP class had several purposes, and that the most important ones were teaching the kids how to master college-level material and instilling both a knowledge of and a love of the subject. Preparing for the exam was seen as a secondary goal at best—useful for calibrating the level of the course and with the possible college credit as a nice incentive to get students to study, but not the central focus of the teaching. I found the discussion refreshing—teachers were talking about the goals of their courses and the value of different assessment techniques without falling into defensive postures or reciting meaningless eduspeak mantras. There was a general feeling that the AP test was about as good as a 3-hour test could be and useful for calibrating course levels, but that a single data point was not sufficient for evaluating student performance. I did not see teachers blaming students or prior teachers for poor performance, nor talking about doing a lot of “test prep”, which seem to be the big problems with how standardized tests are handled in schools in discussions I’ve seen elsewhere. The attitude among the AP teachers seems to be that if they teach a good course with student engagement in a lot of the right content, then the test will take care of itself. Most of the discussion on the AP list is about lesson plans, text books, sources for lab supplies, debugging lab procedures or test questions, and (at this time of the year) review materials. There are occasional complaints about administrators (mostly about ridiculously little teaching time for the course or overcrowded labs, but sometimes about administrators tying teacher evaluations to the single 3-hour test taken by the students), but most of the discussion focuses on the content and pedagogy. I wish there were such discussion sites for the college-level courses that I teach. The teen improv group my son is in has two shows coming up: one this weekend and one in May as part of the Santa Cruz Improv Fest, a month-long showcase of Santa Cruz’s improv troupes. Sunday, April 28, 2013, 7:00 pm. Sunday, May 12, 2013, 7:00 pm. 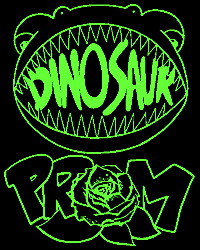 Information about their shows can usually be found at Upcoming Shows | Dinosaur Prom Improv. Although I may be biased as a parent of a cast member, I find their shows to be pretty funny, and the laughter from the audience suggests that I am not alone in this assessment.